No captions were included, so your guess will be as good as mine as to which models they are. 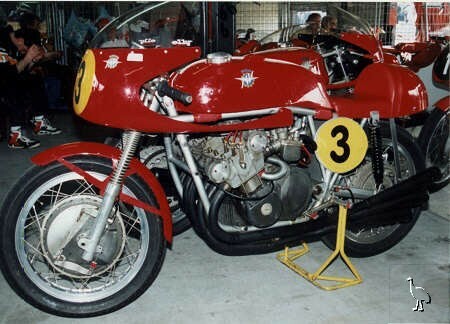 MV Agusta Not exactly overbraked, but what glorious lines! Two pipes visible this side. MV Agusta Quite a late example, judging by the wheels and brakes. Fedor says no photograph does justice to the new MV Agusta F4, and that in the flesh it's absolutely magnificent. Wanted 350 MV chassis - has an engine which came from Murwillumbah NSW, apparently from a crashed bike. It's possible the frame and the rest of it is somewhere out there still.